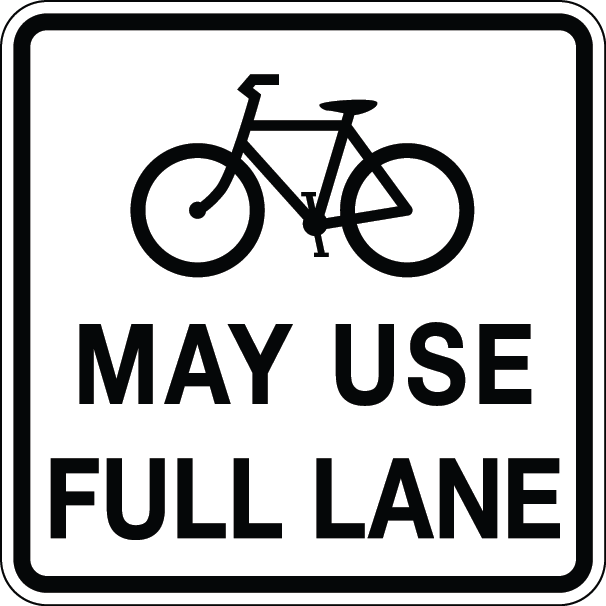 Frank asked: In Florida, weren’t they SUPPOSED to put out Bicycles May Use Full Lanes signs EVERYWHERE in 2011 that had roads that have “substandard-width” lanes, meaning too narrow for a bicycle and a motor vehicle to safely travel side by side in the same lane? They actually had that information on TV in 2010! Whatever happened to that? I would love to know where I can go to suggest that they actually do that! About 95% (My estimate) of roadways without bike lanes in FL have single or outside lanes that are less than 14 feet wide. Paved shoulders are not part of the roadway in the statutes, and bicyclists may use them but are not required to do so. Anyone interested in such signs and roadway markings in other locations should contact their local municipality, county or FDOT roadway representatives, or their local county Bicycle/Pedestrians Advisory Committee. This is an announcement that was made by FDOT regarding Sharrows that were installed on the Bridge of Lions in St. Augustine. BMUFL signs were also installed. 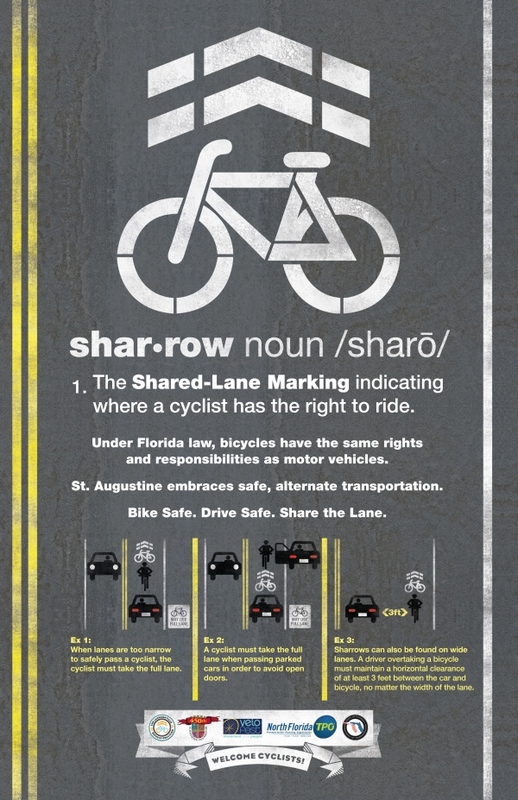 St. Augustine –The Florida Department of Transportation (FDOT) will be installing a new traffic control feature known as the “Sharrow” or “Shared Lane Pavement Marking” on State Road A1A in St. Augustine on the Bridge of Lions to bring awareness to expect bicycle riders. Sharrows are used on narrow roadways where a full bike lane will not fit and there is not enough room for a car to pass a bicycle with the required 3-foot passing width. In this case, it is necessary for a bicyclist to “take the lane” and ride in front of motorists, rather than beside them. Bicyclists who are uncomfortable riding in traffic can still ride on the bridge sidewalk, as long as they yield to pedestrians. Enhances the safe travel of bicycles and motor vehicles in the same traffic lane. Helps position bicyclists on narrow lanes, where cars and bikes cannot travel side-by-side safely. Alerts motorists to where bicycles may use the full lane, as Florida law allows. Tells bicyclists where to safely ride and alerts motorists where to expect bicycles. Guides bicyclists to a safe position next to parking lanes, outside the “door zone,” where a parked car’s opened door may hit bicyclists. The FDOT, along with the City of St. Augustine and the North Florida Transportation Planning Organization, promotes the use of Sharrows to enhance safe bicycling and to bring awareness of bicyclists’ right to ride in the road. I own an electric bike that meets all the requirements to be classified a bicycle under FS 316.003(2), but the West Palm Beach Police tell me I can not ride it on City park bicycle trails/paths because it is a motorized vehicle. Is there a city ordinance which prohibits motorized bicycles on bicycle paths? 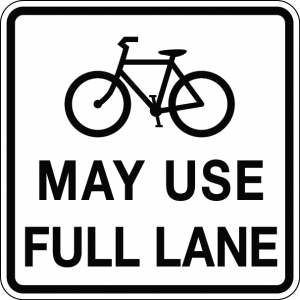 Under Florida law, can a bicycle “full lane use” designation also be used by a city for city streets or is it only applicable to state designated routes and roadways? The state laws and associated traffic control devices apply to all Florida highways, including county and municipality roadways and sidewalks, but other authorities can enact ordinances that affect only their jurisdictions under certain circumstances if they do not conflict with state law. This is one example of local authority powers. There are many others. 4 Pings/Trackbacks for "Bicycles May Use Full Lane Signs"